Cheesecakes. I love them! More importantly, I love to try any dessert that includes cheesecakes as an ingredient. Oreo cheesecake cookies are just one. 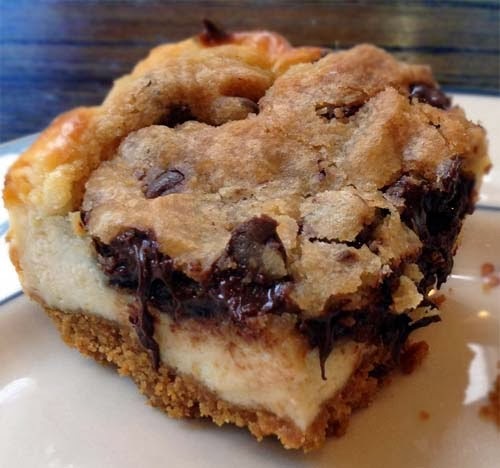 This is another, a recipe for chocolate chip cookie dough cheesecake bars. The name is a mouthful to say, and the dessert is a feast to the eyes. It has cheesecake and chocolate chips. How fantastic is that! I follow the recipe from www.mybakingaddiction.com. Of course, my chocolate chips melted all over, so my finished results do not look like anything that they have. 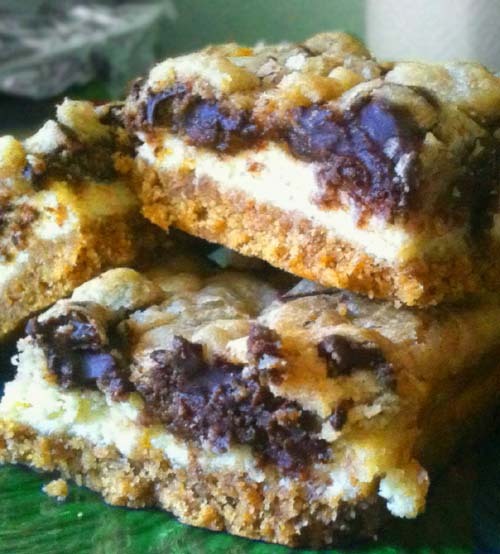 The direction is best explained at http://www.mybakingaddiction.com/cookie-dough-cheesecake-bars-recipe/. Actually, there's a YouTube video from a fellow Pinterest member that I saw first before making this wonderful dessert. I love this type of videos. They're like online cooking courses. Check it out!